Through July 4th at Office Depot you can get QuickBooks Simple Start and Norton AnitVirus FREE after instant savings and manufacturer mail in rebate. 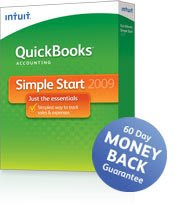 After $20 instant savings on Quickbooks you pay $79.99 and then mail in for an $80 rebate. For Norton AnitVirus you pay $39.99 and mail in for a $20 manufacturer rebate and also a $20 manufacturer Upgrade* mail in rebate. *The Upgrade rebate is only good for current Norton Antivirus users.